This is my go to treat, it helps when that chocolate craving hits and due to its rich texture you only need a small bit and your cravings are satisfied. It took me a while to get this recipe right and after a good few trials, there were never really any errors as it was still always eaten, I have finally found the recipe I like and that I am happy to share. Add oil and maple syrup in a bowl and mix well. Gradually add the cacao powder and mix well until you get a smooth consistency. Spread out onto some baking paper or tinfoil as thick as you like. Carve into squares as big as you want. Place in freezer until they are hard. Break off a square or two :) and enjoy! Thank you to the Lovely Indy Power, Little Green Spoon for this soup inspo. 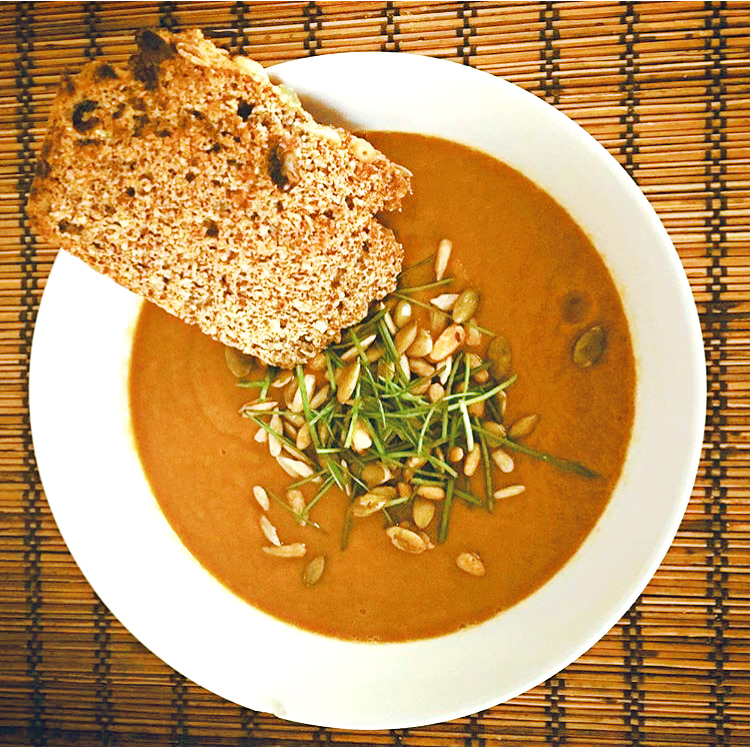 I was never a soup fan until I tasted Indy's Spiced Sweet Potato and Carrot Soup. I was really looking forward to making this soup the other day but realised I had no carrots at home. I did have organic parsnips growing in the back garden so I thought that will do, hopefully! Using Indy Powers recipe but replacing the carrots with the Parsnips, the soup turned out really well. It was not as sweet as if you used carrots but it was very delicious and comforting. Peel your sweet potatoes and Parsnips and chop into cubes. peel your garlic cloves and pop the lot into a bowl and toss around with some olive oil and a pinch of sea salt. Place on a baking sheet and tray and pop in the oven to roast at 200'c for about 25-30 mins until you can easily pierce the sweet potato cubes with a knife. Once your sweet potatoes and parsnips are done, grap a large saucepan and on a medium heat add your olive oil, cumin and turmeric and toss around for 1 minute, then add your chopped onion and place the lid on and let simmer for a few minutes until the onion is soft and mixed with the spices. Then add your 750ml of water and your sweet potato and parsnips and place the lid on and let simmer for 10 minutes. Once the 10 minutes are up take off the heat and with a hand blender, blend everything together until smooth. Pop the lid back on and toast your seeds in the oven until the are lightly brown, make sure to watch them. Serve with a sprinkle of your seeds on top and enjoy! This is one of my favourite salad recipes. When people think of salads they usually imagine a plate of just leaves and maybe some sort of meat. This is not the case. Salads can be so delicious and nutritious. I fell in love with salads when I lived in Australia, the various amounts of salads available were never ending and it was something I always looked forward to ordering when eating out. 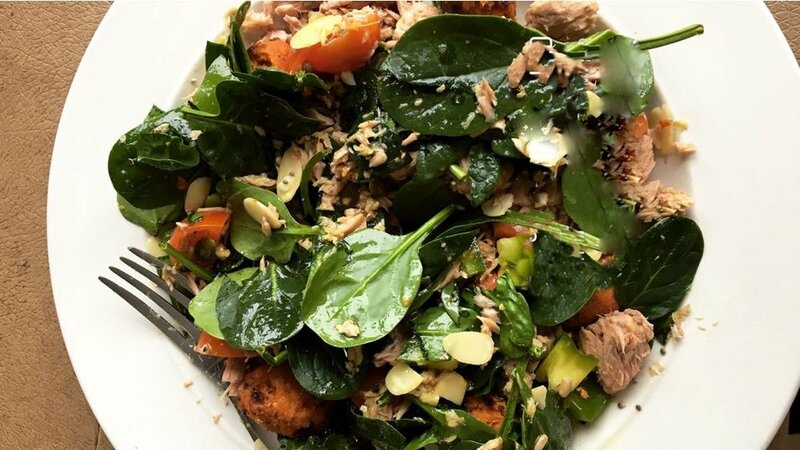 Here is one of my favourite salads that I put together. Dry ingredients - Place spinach on a plate, chop up some green or red pepper and place on top of spinach, dice the zucchini and place on top. sprinkle in almonds and seeds. Cut the cherry tomatoes in half and add to plate. Add your drained tin of tuna and sprinkle the chia seeds over the salad. Wet Ingredients - Squeeze your lime into a cup or jug, chop up the garlic and ginger and add to the cup, then add the cumin and stir around with a spoon. when ready to serve add your olive oil to the cup and pour over your salad and Enjoy!